The weather lived up to the forecast and provided good conditions for most of the AKFA members who turned up with their large kites. It turned out to be a mini version of the Adelaide kite festival, with many types of kites represented. Foils, Flowforms, inflatable creatures, soft stunters and sparred kites. A quick check with a wind meter revealed an average of 20kph gusting to 28 kph from the SSW. About the only thing that had trouble in this breeze strength was my little 2-Skewer Barn Door which could have done with much more tail. We were flying in a fairly confined area, and a row of short trees caught a few of us out from time to time! Dunes were upwind, and although fairly low, they still messed with the airflow up to around 50 feet or so above the grass. My son (8 yrs) was impressed with the speed of the spinning drogues on one of the flowforms. All in all, a good fly day was being had by all, as we left to head home which was an hour away to the South. Aren and I turned up at the beach near Fort Glanville where at first there only seemed to be one large kite flying. A black scuba-diver with white jellyfish trailing behind moved fluidly as 'line laundry' suspended from the flying line of a large parafoil. Plus a large inflated fish was suspended near the anchor point. Close enough for kids to touch! After a walk around, we noticed other kites too, further down the beach. A small stunt Delta was zipping around silently. Much further to the South, and not connected with the AKFA event, many kite-surfers were enjoying the smooth moderate to fresh breeze. Having found a good open location down on the sand, we set up the Peter Powell MkIII. The very latest version of the amazingly successful original which shot to popularity in the 70's and 80's. A steerable foil was being flown just upwind of us. These soft kites apparently pull a lot harder than sparred stunt kites of an equivalent size. Finally, we headed back to the small grassed area where the AKFA banner had been flying on a pole and kicked a ball around for a few minutes. A couple of small Delta kites were just managing to stay in the air. The wind strength was getting a bit much, plus turbulence was coming of the low dunes nearby. The wind meter registered 23 kph gusting to 31 kph, held above my head. On arriving home and checking the weather online, the gust strength had climbed into the mid-forties an hour or two later! Two KAP (Kite Aerial Photography) sessions were in progress. A large inflatable Caterpillar gave an impressive although fairly static display as it sat on the sand, lined up with the wind. As windsocks do, even the fanciest of them like the Caterpillar. The owner also had his large Octopus up at one stage, which apparently managed to drag a 200 pound sand anchor out of its hole during a spell of very brisk wind! At least a couple of fairly big parafoils were up plus a most unusual design which looked like a cross between three Deltas and a Box kite. Others were enjoying some fast flying with soft stunt kites. After obtaining some video of my own 2 meter (7ft) Carbon Diamond #2, I let it out on 200 feet of line. This pushed it to the limits of its tail-less stability, the 30kph gusts forcing it almost to the sand. First to one side, then the other - so it wasn't a simple matter of doing a bridle adjustment. Finally, a couple of cliff jumps off the dunes under a large power kite were recorded on video. All in all, this outing is going to result in at least three videos on Facebook next week! The day before, the forecast was for an offshore 3kph breeze. A bit light, to put it mildly! However, on the Sunday morning, 11 to 17 kph was being recorded at two coastal locations South of Fort Glanville. Ideal. After lunch, we arrived to find several AKFA kites up in light but smooth winds coming off the ocean. All at fairly modest heights to avoid the possibility of contacting cars in the car park, if anything went wrong! A power Sled, a flat Penguin, a 'Firebird' Delta to name a few. Some line laundry under a sizable parafoil too this time, in the form of a scuba diver swimming past a translucent white jellyfish. We took some photos and video. I'll post a video later this week on Facebook. More people arrived later. Resulting in a few small colorful Deltas floating around over the sand. Mike the omni-kiter (he flies everything) went off a sand dune 'cliff' under his largest traction foil. We missed it. However, he said he needed a bit more breeze to do a really good job of it! Our first kite up was the 1.2m Dowel Dopero, followed half an hour or so later by the 2m Carbon Diamond. Both kites relishing the 10 to 15kph airflow at about 150 feet over the sand. However, sudden lulls downed most of the kites on at least two occasions. To our surprise the Dopero managed to re-launch itself off a low dune while the big Tyvek-sailed Diamond was being packed away! A quick meter reading showed around 6 gusting to 8.5kph at shoulder height at this time. A good outing in sunny conditions despite the chilly breeze! 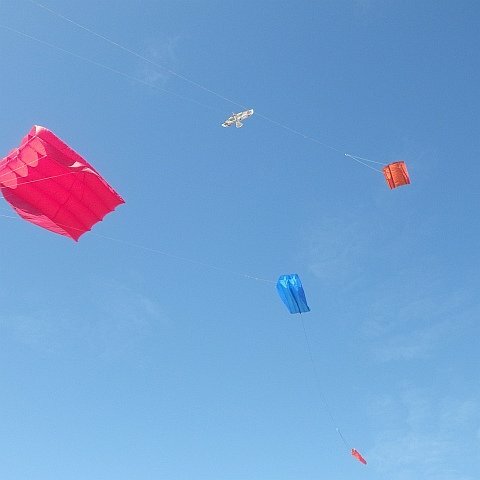 The Adelaide Kite Flyers Association flies on the beach near Semaphore most months, on the second Sunday from midday to 5pm if possible. Today I turned up to find very little breeze but a few AKFA members were on the grassed area. A large Dolphin inflatable was laid out, having some bridle lines adjusted. Apparently the bottle-nose had been looking more like a pug-nose in recent flights! At first, my 2-Skewer Delta on 20 pound Dacron line was the only kite to really suit the very light and variable breeze. Even so, it managed to end up on the dunes a couple of times. With the line draped over a brush fence which seemed designed to trap kite lines at the slightest opportunity! Another Delta struggled up a few times but was not able to sustain flight. But then out came an intriguing-looking design, a Canard kite. Two small triangular sails at the front, with a single larger sail behind. Spars were carbon rods, bent to graceful curves. A design from Prism, called the Zero. This was obviously a light-wind kite, and it fared better than the previous Delta. A couple of kid's Deltas were flying about at low heights, over the dunes. Flown by kids, naturally. One kite was struggling with insufficient tail causing it to loop around a lot. But the fliers were still having fun it seemed. Another unknown flier had put up a large retail Delta, from down on the sand closer to the water. It just managed to stay up but was evidently struggling from time to time during the lulls. A disappointing time for the owners of kites that needed just a few extra kph to have any chance of flying. But the 2-Skewer Delta had many minutes of air-time at around 150 feet off the grass and dunes. The sunny Winter weather was actually very pleasant and it was good mixing with a bunch of other kite-fanatics!